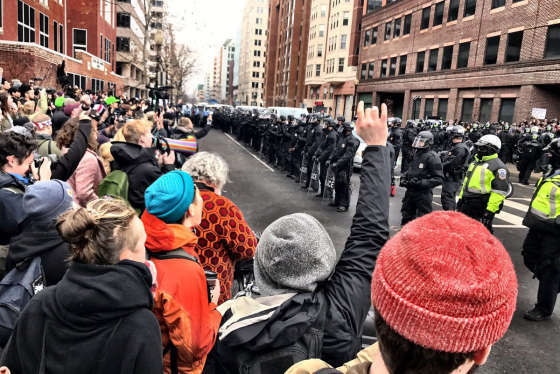 Six protesters indicted for rioting in the nation's capital on Inauguration Day were acquitted of the charges, after a monthlong trial in D.C. Superior Court. 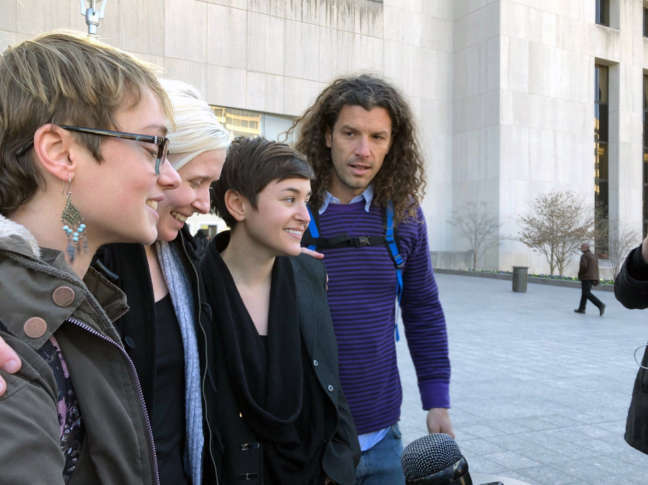 WASHINGTON — Six protesters cleared of all charges related to riots that broke out on Inauguration Day were jubilant and declared a victory for lawful dissent after a jury found them not guilty Thursday following a monthlong trial. The jury began deliberating last Friday before delivering its verdict Thursday morning in D.C. Superior Court. Defendants described their reaction in the courtroom as relief, followed by hugging and sobbing. “This isn’t just about the six of us. This is about the other 188 people that are left to go. … All we can do is hope that these acquittals really set the stage for them to also get acquittals,” Macchio said. Next year, the remaining 188 protesters will go on trial in groups of five or six. Each of the defendants — Macchio, Jennifer Armento, Oliver Harris, Brittne Lawson, Christina Simmons and Alexei Wood — faced the same set of seven charges: two misdemeanor counts of engaging in rioting, and conspiracy to riot, as well as five felony destruction of property counts. Earlier, Superior Court Judge Lynn Leibovitz threw out each defendant’s inciting a riot charge — a felony that carried a maximum 10-year sentence. Leibovitz concluded that “no reasonable juror” could find that the prosecution proved the six defendants encouraged others to riot. Prosecutors acknowledged that they had no evidence that the six defendants wielded hammers or crowbars, or threw bricks at police officers, but said that they were knowingly participating in a planned riot on Jan. 20, 2017. Defense attorneys had argued their clients should not be held responsible for the actions of others, and called the prosecution politically-motivated, and an attack on First Amendment rights to free speech and association. Prosecutors suggested in a statement that they intended to proceed to trial, saying they hoped juries would provide the same “rigorous review” for each pending defendant as was done in this case. The next trial is set to begin in March. The U.S. Attorney’s office defended its decision to pursue criminal charges. Windows were shattered, newspaper boxes and a limo set on fire and items hurled during the melee, which began before President Donald Trump was sworn into office, and continued throughout the afternoon. More than 200 people were arrested that day. The ACLU has filed a lawsuit against D.C. police on behalf of four demonstrators accusing police of an “unlawful mass roundup,” pepper spraying nonviolent protesters and holding detainees for hours without food or water or access to bathrooms. The legal action group cheered the verdict. “We hope today’s verdict begins the important work of teaching police and prosecutors to respect the line between lawbreaking and constitutionally protected protest. We hope that the U.S. Attorney’s Office gets the message and moves quickly to drop all remaining charges against peaceful demonstrators,” Scott Michelman, senior staff Attorney for the ACLU of D.C. said. Protests turned violent Friday morning as inauguration demonstrators armed with crowbars broke storefront windows, damaged vehicles and threw rocks, injuring several police officers.